Provided its particular brand of grit is your cup of tea, you'll have no problems honing in on the dirty sound you're after with the Boneshaker. Fuzz-tinged distortion won't be for everyone. 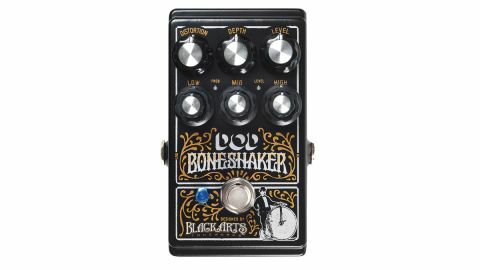 A collaboration with boutique builder Black Arts Toneworks, the Boneshaker aims to provide heavy tones to suit extended-range and baritone players. A three-band EQ with individual levels provides huge gain-shaping potential, while a depth knob rounds and pushes the lows to cut through. The pedal sounds mighty with everything at 12 o'clock or with specific frequencies boosted, straddling the line between distortion and fuzz.